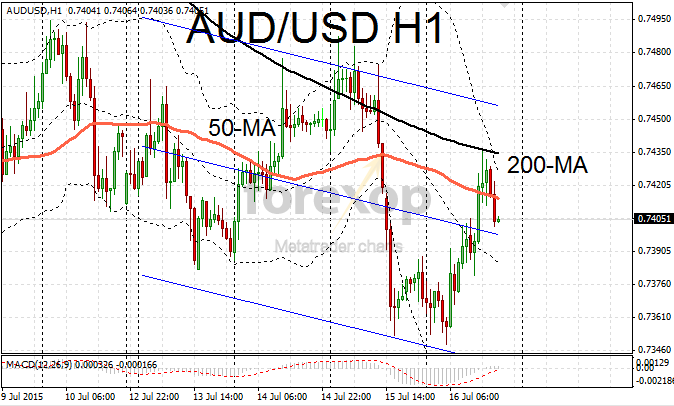 The Australian dollar rebounded after yesterday’s sharp falls. The bearish sentiment was prompted by a surprise rate by the Canadian central bank. 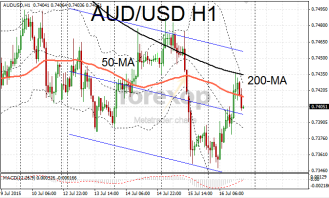 Today’s rebound took AUD/USD back up to the 200-hour moving average at 0.7420 where the rally lost momentum and a brief sell off took the pair back to 0.7404. The move in the Australian dollar was possibly overdone and today’s correction took the pair back within the previous trend. AUD/NZD surged by 1.5% today moving back up to 1.1355. The New Zealand dollar was weaker across the board after a disappointing set of economic data last night. Consumer prices fell below expectations in the second quarter. The CPI was 0.3% but missed forecasts by 0.1%. The price of dairy products, on which the economy is heavily reliant, also fell sharply by 10.7%. New Zealand’s economy continues to struggle amid a slowdown in demand from China and ongoing supply issues in the dairy industry. The latest data prompted markets to raise their expectations for the central bank to lower interest rates. NZD/USD also struggled to make any headway. The pair continues to trend downwards in a punishing bear rally that’s erased 16% off the value of the currency. Falling to 80.77 NZD/JPY didn’t fare much better. The pair is moving towards the critical support at the 200-week moving average which could see it extending further downwards – possibly as low as 78. Crude oil fell for a second day as traders digested the impact of slowing demand in Asia and the Iranian nuclear deal. Lifting of Iranian sanctions could further add to the global supply glut. Brent crude fell by 50c to $56.9. Industrial metals were mostly weaker with the exception of copper.